AUGUST 2016 UPDATE - For a limited time GuitarJamz is offering a "flash sale" for this DVD set at 70% off! Click here for more details! If you've been reading my blog, then you know I'm a huge fan of Marty Schwartz's teaching style for guitar. After being introduced to him via his free lessons on YouTube, I started seeing improvements in my playing and decided to purchase his Guitar Coaching Club package. Since that time, I've been working through and enjoying his DVD sets! In today's post, I will be reviewing Marty's Guitar Chord Expander & Rhythm Master DVD set, along with an included Bonus Rhythm DVD. Who is this DVD set for? Note: If you are a complete beginner on guitar, this DVD set is not for you! Can you comfortably play and switch between basic open position chords? Are you able to successfully barre chords on the guitar? Do you know the notes on the low E and A strings? Tired of playing open position chords? I don't know if you're like me, but when I started learning guitar, eventually I felt like I didn't know where to go in my playing after learning the basic open position chords. I knew major, minor and 7th chords and how to use them in songs, but I felt limited in that I didn't understand how to use the rest of the guitar fretboard. I watched other players easily move all over the guitar neck, but I was stuck. Once you learn and apply the techniques from the CAGED system taught in Marty's Chord Expander DVD set, your playing will never be the same. Seriously, the CAGED system is awesome! What is the CAGED system? At a very basic level, you start with the shapes of a C, A, G, E and D chord (which spells out the word CAGED - this letter order is very important). By combining one of these shapes (C, A, G, E or D) along with a barre (using your index finger across some or all of the strings), you can move up and down the fretboard and quickly be able to play new chords all over the guitar neck! It really can help with visually mapping out the guitar fretboard, which is ultimately a big grid when you look at it from a high-level. Marty goes into extensive details on how to use the CAGED system, as well as some of his favorite embellishments that can give these basic chords new sounds and voicings. For example, instead of always playing a D Major chord in the standard position, you will have multiple versions (available all of over the guitar neck), as well as extra notes you can add (or subtract!) to make this chord shape have more depth to it. By knowing the individual notes on the E and A strings, you can easily move these shapes to play different chords (including sharps and flats). This DVD set focuses more on major and 7th chords, but Marty also covers how to use the CAGED system for minor chords as well as the arpeggios associated with each chord shape. I think this knowledge is so important if you want to progress as a guitarist, and Marty makes the learning process fun and much less complicated than I have seen with other instructors. The other DVD's in this set focus on rhythms and strumming patterns. In my experience, rhythm was something that I was lacking (and still continually look to improve upon). I felt comfortable playing chords, but combining this with strumming patterns is so important, especially if you want to confidently play or create unique songs. It's important to be comfortable switching between chords as well as have experience with barre chords before getting into these rhythm exercises. Some of them can be quite challenging. However, what's great about DVD's is that you can pause, rewind and play them over and over until you get it! This package includes 2 Rhythm Master DVD's as well as a Bonus Rhythm DVD set. Some of the lessons combine your knowledge of the CAGED system (from the first 2 DVD's) and then incorporate this into rhythm exercises and embellishment techniques. You can also take parts of the chord shape and create triads, which give you lots of flexibility to play a chord using only 3 notes (often located on 3 strings). Again, this DVD set is not for beginners. However, if you are comfortable with open position chords, basic barre chords, and know how to switch between chords, I believe the CAGED system is an awesome tool to help you become a better player! Marty's Guitar Chord Expander & Rhythm Master DVD set helped me to focus on the chord shapes (and important partial shapes), fun embellishments to add on and help with reviewing the corresponding arpeggios. In addition, the rhythm exercises were fun and I felt that they helped to focus on moving away for the old strumming patterns that I relied upon so often. 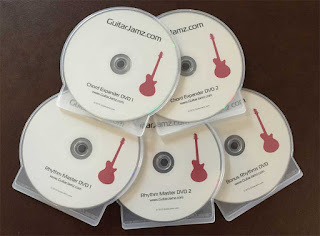 There are hours worth of content on these DVD's, but if you take the time to work through them, I found them to be extremely useful for my overall guitar knowledge and playing ability. Are you ready to learn the CAGED system and become a rhythm master with Marty? Click here to order Marty Schwartz's Guitar Chord Expander & Rhythm Master DVD Set!